To make the fruit mince filling, place apple, currants, almonds, dates, cranberries, butter, sugar and orange juice in a bowl, mix well, cover and soak for 1 hour. Preheat oven to 160°C (320°F). Roll out the pastry on a lightly floured surface until 3mm thick. Use a 6.5cm-round cookie cutter to cut out 24 rounds. Line 24 x 1½ tablespoon-capacity (30ml) lightly greased mini-muffin tins with the rounds and spoon in the filling. 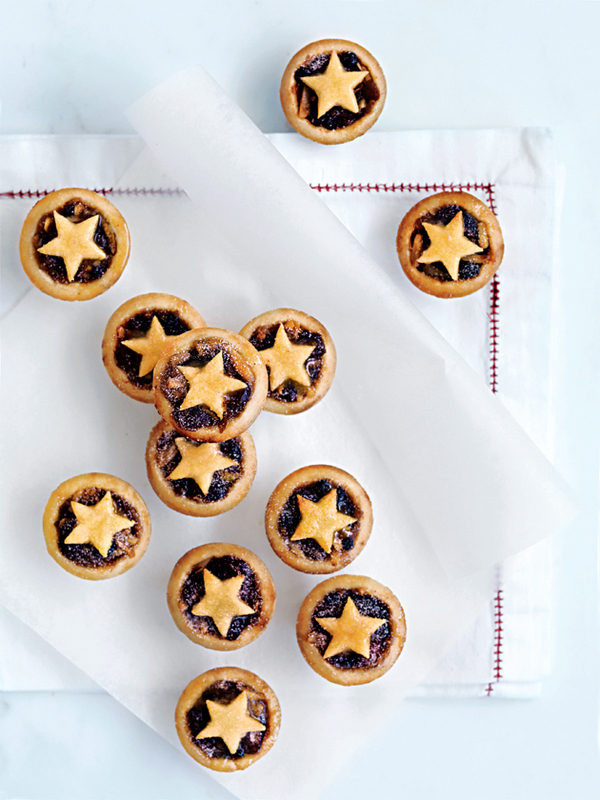 Re-roll pastry scraps to 3mm thick and use a small star cookie cutter to cut out 24 stars. Brush tops with milk and bake for 25 minutes or until golden. Cool on wire racks and dust with icing sugar to serve. Makes 24.